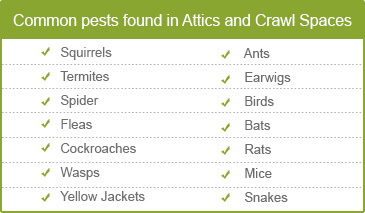 Rummaging through dust and cobwebs in your attic and crawl space is the least of your worries. There are some real and serious hazards present in these functional areas which often affect the health of every room in the house. Yes, we are talking about rot, mold, termites, faulty air ducts, unwanted furry gremlins and much more that slowly takes shape in these often overlooked dark confined regions. You must catch these culprits and deal with them quickly before the situation spirals out of control! It’s as easy as a phone call! Hire a professional company like Quartz Solutions, the best in the field for regular maintenance and monitoring of these hidden areas to lower the risk of long-term problems. It’s no wonder homeowners never venture into the attic and crawl space willingly. These dark, dingy regions are an open invitation to a range of serious threats that can potentially destroy the physical representation of your precious property. Excessive moisture and humidity provide ideal conditions for mold, mildew and fungus to grow rapidly. These impact indoor air and also damage the very foundation of the property. Spiders, wasps, ants and yellow jackets are insects which love dark cool environments and make it their haven. They are carriers of germs and spread dangerous infections. Animals such as squirrels, raccoons, house mice, bats are notorious for nibbling at ducts, insulation and wiring cables. Moreover, their waste triggers allergies and creates a stench. Pests like termites and carpenter ants eat into the wooden panels and beams which destroy the structural integrity of the dwelling. Defective ductwork and damaged insulation can impact the efficiency of the existing heating and cooling equipment, resulting in high energy bills for homeowners. A thorough inspection of the attic and crawl space is the first step in the process of making homes safer and more comfortable. The big advantage of using the services of Quartz Solutions is that we have a vast experience, expertise, and extensive training to tackle attic and crawl space woes. Our skilled and dedicated workforce will drop in for a pre-analysis of the region at a time that suits you. The team will cover every inch of the region and meticulously check for pests, critters, leaks, dangerous gases, broken duct, ventilation etc. A viable remediation plan that is easy on the wallet will be formulated to eliminate all contaminants as safely as possible. Quartz Solutions provides attic and crawl space cleaning techniques that can rival none in the industry. Moreover, the high-quality services are pocket-friendly and extremely affordable. It comes as a big surprise that Clark a small township of under 14,000 in Union County, NJ is often an over-looked community! Apparently Clark has a lot going for it! Excellent schools, golf and tennis, relatively low crime and pollution, lush green space, affordable housing and more. In addition, Clark is just a 30-minute drive to NYC, the most exciting city in the world. We at Quartz Solutions are very proud of this community. Let us do our bit to enhance its image further by making the homes and businesses safe, comfortable and hygienic. 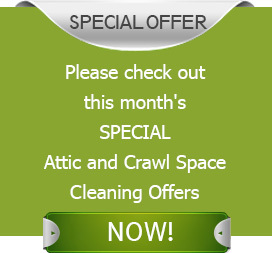 Hire us to keep your attics and crawl spaces immaculate! Call today at 973-536-1013 for a complimentary inspection and consultation!